Raise your hand if you are not a mayo lover! I have my hand held high as I have not yet acquired any sort of taste for mayo. This is an homage to my Dad and my Grandpa, bless their loving hearts. Growing up my Dad would say to me on occasion, “Oh, you’ll learn to like mayonnaise. Just keep trying.” And, I just remembered this also applied to ANY sort of salad dressing. Well over the years I did keep trying the mayo and to this day I have yet to acquire even a smidgen of love for the stuff. The salad dressing (only the vinegar and oil varieties) is another story. I did learn to like those in my mid-twenties, and have had occasion to make some yummy homemade dressings. There is a running joke with my dear Grandpa, who I don’t get to see that often, that he always has a jar of mayo waiting in his fridge for me. Ready at any moment for my sandwich of the day. And once again to this day mayo and I just don’t get along. So you may be asking yourselves how can I get along in this world without mayo. Well, once I learned to like vinegar and oil salad dressings it was easy for me to have a “non-dry” sandwich. Otherwise I would just eat a sandwich dry, and with or without veggies. As for dishes like potato salad, or a macaroni salad, I steer clear of anything at the buffet bar that even remotely looks or smells like it has any mayo in it. Over the years I have learned to make a killer sour cream, potato salad (this is the no mayo allowed variety). For many years my kids were not even aware that there was any other form of potato salad. And now my potato salad is such a hit at family parties that my kids pass the recipe along to their friends! 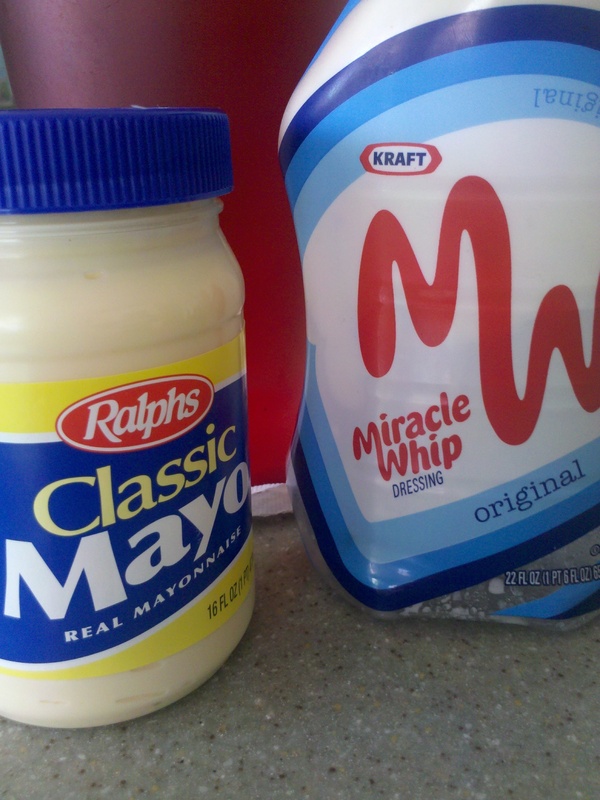 So to my Dad and Grandpa- thanks for all your mayo loving ways. But I will forever remain in the Non-Mayo world. The funny thing is, I only now eat mayo occasionally. Just doesn’t taste that good anymore!